Gertie spies a tasty rock to help balance her diet. The first Cartoon, Movie Maniacs! 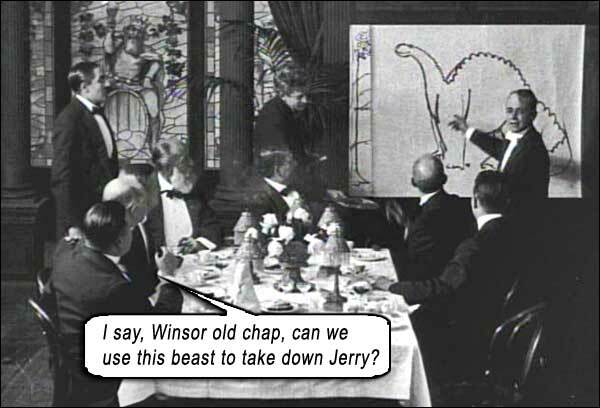 GERTIE THE DINOSAUR is an animated, silent, black-and-white short film, written, produced, directed and animated by cartoonist Winsor McCay, and for its innovation, ingenuity and primacy, we forgive it for its many shortcomings. The story is brutally banal: A man makes a bet that he can animate a dinosaur, shows off the results at his Illuminati meeting, and is paid. However, the art of cartooning itself was jump-started with this winsome trailblazer. Film historians might argue that GERTIE was preceded as a cartoon by many other contenders: James Stuart Blackton’s HUMOROUS PHASES OF FUNNY FACES (1906), two of McCay’s own works (the short films LITTLE NEMO, 1911, and HOW A MOSQUITO OPERATES, 1912), the many short animated films of Émile Cohl (called “The Father of the Animated Cartoon”), and many works from one of the pioneers of modern film Georges Méliès. Though all these works were in the “cartooning” wheelhouse, GERTIE is the first to use this particular frame-by-frame animation technique that would be the basis of all cartooning processes to come. There is a live-action prelude to the actual GERTIE cartoon, where the cartoonist himself, Winsor McCay, is being driven along with a few other doughy white men in hats and suits, all crushed into one o’ them new-fangled auto-mo-beels. They get a flat outside the American Museum of Natural History, and decide to visit the Museum while their white slave fixes the flat. CARS (or horseless carriages) were about 30 years old. FILM (or moving pictures, aka “movies”) was in its infancy, younger than cars. DINOSAUR discoveries were only gaining understanding by the mid-1800s, and dinosaurs were not as prominent or popular with the public as they are now. 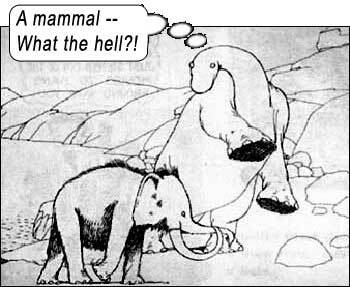 Therefore, even featuring a dinosaur in his cartoon was a big conceptual leap for McCay. WORLD WAR I – amidst the frivolity of GERTIE, the stupidity of The Great War! Then an attempt at Comedy: McManus wants to view some of the frames, so McCay loads up a pissboy’s arms, seemingly arbitrarily grabbing piles of drawings, even though we imagine these drawings must be returned to these piles in meticulous order. (Why must they even leave this room? Can’t McManus come up one flight of stairs to see these drawings?) Pissboy is piled on until he cannot see in front of him and can hardly walk with the pile (does McManus have to see this many to get the point? ), and takes a tumble down the stairs in an Abbot-and-Costello-like whoop-de-wheeeuw. The cartoon itself is nothing spectacular. It is the fact of its existence that is mind-bending. There had to be THIS – this first glimpse of what potential this art-form held – for the industry itself to get to FANTASIA or TOY STORY. There is no great plot. 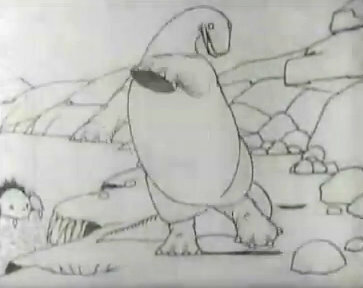 There is Gertie the dinosaur (anatomically resembling that Apatosaurus skeleton, complete with the wider Camarasaurus skull), walking up to the camera, amidst a background of rocks and a lake, and performing basic tricks at the cartoonist’s behest, like raising her left foot then right foot, eating a rock, eating a tree, and picking up a passing mammoth by the tail and hurling it into the lake. 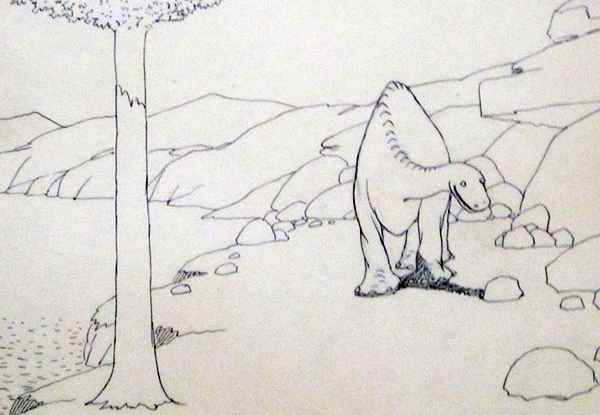 She scratches her head with her tail, dances on her hind legs (no one would mistake her for the brachiosaur that Sam Neill gasps up at, “It’s – it’s a dinosaur!”), and then Gertie picks up an animated version of McCay and walks out of frame with him on her back. Again, we note the differing cultural norm visibly displayed in the cartoon – as the animated McCay holds a WHIP, and uses it on Gertie to make her walk off. Really? Even though she understands English quite well, demonstrated by her performance of his banal requests, and “Did you see the four-winged flying lizard?” to which she nods. Starring: Winsor McCay, George McManus, Roy L. McCardell.